AUSTRALIAN AUTHOR Go from "fat" to fab in no time with this inventive, inspirational quilting guide. If you're a quilter, or hankering to become one, then you probably know we're talking fat quarters - quarter yard cuts of fabric cut wide. 18" x 22" cuts to be precise. Who can resist a stack of beautifully coordinated fabrics all neatly folded into a bundle and tied with a bow? It's like getting a stack of buttermilk pancakes dripping in syrup and you can't wait to dive in! Fat quarter bundles are everywhere these days, which makes it the perfect time for a DIY book like By the Bundle. Discover 12 fat quarter quilting projects that will dazzle any room. The 18" x 22" cuts allow you to sample all kinds of fabrics, but sometimes there's just not enough to make an entire quilt. By the Bundle solves that problem by offering you 12 quilting projects - from the beginner-friendly to the complex - designed specifically for turning fat quarters into fully completed, totally impressive quilts. By the Bundle features 12 fat quarter quilting projects including: Boxes and crosses Diamonds and squares Rainbow pyramids Butterflies Star bursts Maximize your fabric yield as you piece together the most glorious quilts. Whether your cuts are from a single fabric collection or a complementary combination of many fabric lines, By the Bundle gives you the bandwidth to turn fat quarters into fabulous quilts. 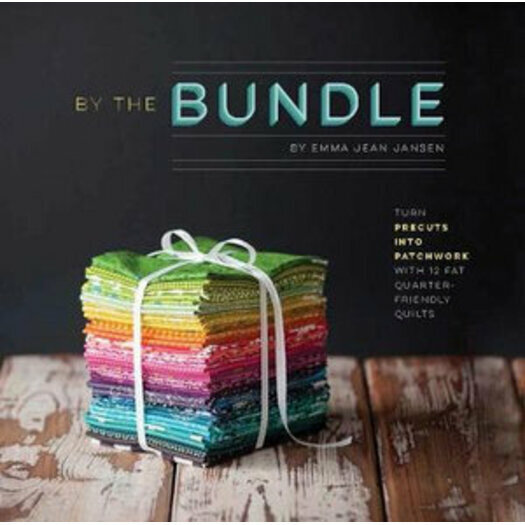 AUTHOR: Emma Jean Jansen has been in the patchwork and quilting industry for over 10 years. She studied Textile Design at RMIT and is currently designing fabric for the Australian company Ella Blue, available from Charles Parsons She blogs at emmajeanjansen.com.au and lives in Australia.